Fantasy Flight Games is proud to announce the fourth wave of figure packs for Imperial Assault: the Alliance Smuggler Ally Pack and the Bantha Rider Villain Pack! Across the Star Wars galaxy, the Galactic Empire reigns supreme. But even the Empire cannot be everywhere or regulate everything, and so those who live outside the law make their way on the fringes of society, preying on the weak and fighting to survive for another day. 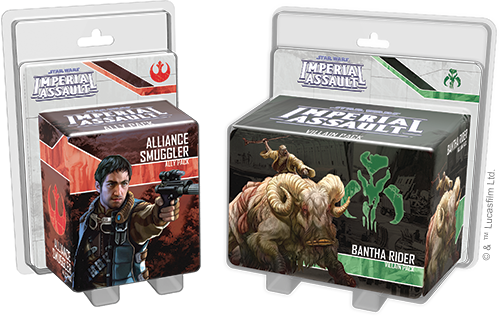 Whether you smuggle supplies and weapons for the Rebel Alliance or raid settlements with a Tusken Raider warband, you can bring your own brand of lawlessness to Imperial Assault with the Alliance Smuggler and the Bantha Rider. 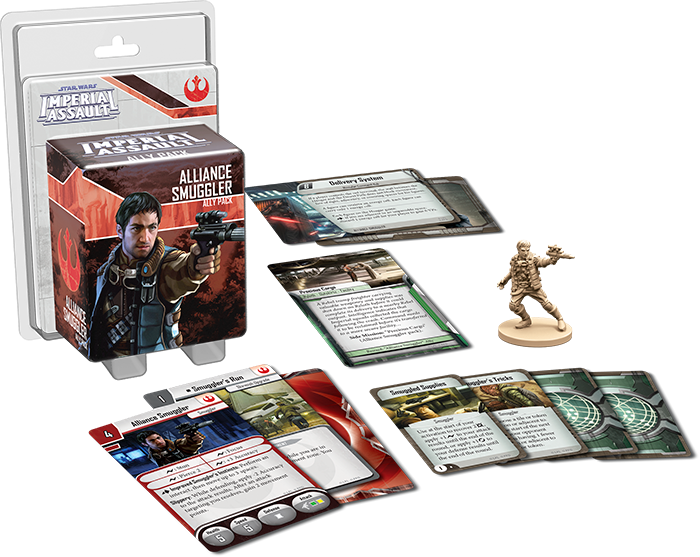 The Alliance Smuggler Ally Pack and the Bantha Rider Villain Pack aren’t directly associated with any other Imperial Assault expansions, meaning that these characters enter the game for the first time in these figure packs. 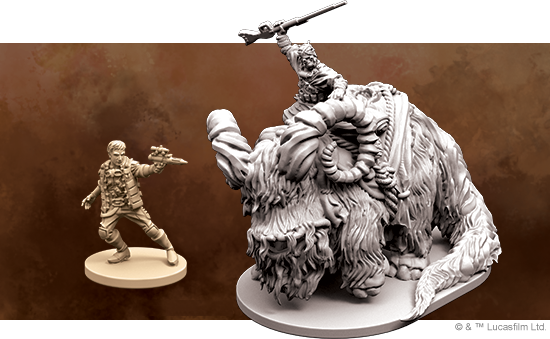 Like other Ally Packs and Villain Packs, both of these expansions offer a sculpted plastic figure alongside a new campaign side mission and two new skirmish missions that share a map. Joined by new Agenda cards, Command cards, Deployment cards, Reward cards, and Skirmish cards, these figures introduce new tactics for your campaigns and skirmishes! In the skirmish game, the Alliance Smuggler is a powerful ally who can stun enemy figures or slip away from Stormtroopers and other enemies before they can pin you down with blaster fire. 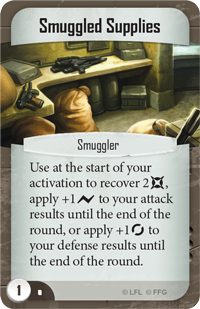 You might even embark on a smuggling run into your opponent’s deployment zone to gain some additional victory points! The new Smuggled Supplies Command card gives your Smuggler characters a boost when they need it most, and two new skirmish missions invite you to battle across the Mustafar Command Hub to make a critical datalink or deliver energy cells to your allies. You may also call upon the Alliance Smugglers to join you in the campaign game with an entirely new side mission. In the Precious Cargo campaign side mission, you and your fellow heroes journey to Ryloth to recover the cargo of a tramp freighter shot down by Imperial forces. With the help of an Alliance Smuggler, you may regain the freighter’s cargo for the Rebellion and secure the services of the Alliance Smuggler for future missions. But the Empire is already on the trail of the cargo, and they’re certain to try to claim this cargo for themselves! The indigenous people of Tatooine, the Tusken Raiders, are known for their lightning-fast raids and ferocious battle tactics as they attack Tatooine’s moisture farmers. The Tusken Raiders are also known for riding out of the desert on banthas – massive, horned beasts that can easily trample those who anger them. 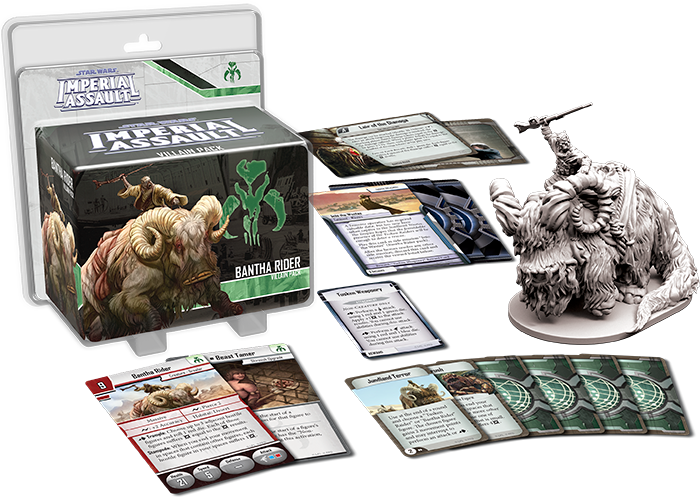 With the Bantha Rider Villain Pack, you have the opportunity to swell the forces of the Tusken Raiders from Twin Shadows and ride a bantha into battle in Imperial Assault. The power of a Bantha Rider can rout entire squads of lesser figures in your Imperial Assault skirmishes. While the Tusken Raider riding atop the bantha fires at select figures, you can use the Bantha itself to trample your opponent’s figures, crushing them beneath its massive feet or stampeding into a squad and destroying their formation. Six new Command cards offer plenty of tactical options to any army, but your Tusken Raiders and Bantha Riders could especially benefit from the extra movement and attacks granted by Jundland Terror . Furthermore, the new Coruscant Landfill skirmish map challenges you with two distinct missions that invite you to fully harness the massive size and power of your Bantha Riders. 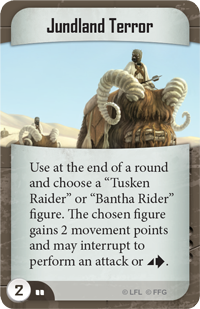 You can even bring a Bantha Rider into your Imperial Assault campaigns with a new three-card Agenda set, Tusken Treachery. The Into the Wastes Agenda mission challenges the Rebel heroes to rescue a captive abducted by raiders and secure stolen data, but if they fail, the Imperial player’s forces can take advantage of Tusken Raider weaponry for the rest of the campaign! You may use the other Agenda cards in this set to bring Tusken Raiders or the Bantha Rider into a mission unexpectedly, or to ensure that even a small wound proves dangerous to the afflicted hero. Whether you fight to support the Rebel Alliance, prey on the weak with the Scum and Villainy of the galaxy, or search for unorthodox allies for the Empire, you’ll gain new figures, missions, and tactics for your forces with the fourth wave of figure packs for Imperial Assault! Look for the Alliance Smuggler Ally Pack and the Bantha Rider Villain Pack at your local retailer in the fourth quarter of 2015!